Scientists are compiling a crop structure map for the Mekong Delta to counter growing climate change impact in the region known as the country’s food granary. Farmers till a field in the southern city of Can Tho. Scientists are compiling a crop map for the Mekong Delta to counter the growing climate change impact in the region. The plan will determine which crops would be cultivated and on what scale based on annual weather and natural disaster predictions, said Nguyen Hong Son head of the Department of Cultivation under the Ministry of Agriculture and Rural Development. "The map will help authorities and farmers prepare appropriate production plans," he told a seminar in Can Tho Province last week. However, Son cautioned that the plan cannot cover the entire region, just the large sub-regions of the Dong Thap Muoi and Long Xuyen quadrilateral, Ca Mau Peninsula, coastal areas, and alluvial zones. Bui Tan Yen, a scientist from the Research Programme on Climate Change, Agriculture, and Food Security (CCAFS), explained the vulnerability of the Mekong Delta region to adverse climate change impact, especially extreme drought, flooding, and salt intrusion. Yen said a wealth of research on natural disaster risks has not been “utilised well” to devise early warning systems and plans for coping with disaster. Since there are varying natural characteristics, production practices and infrastructure development levels in the sub regions of the Mekong Delta, the master plan must be customised for each locality, he added. He proposed categorising natural disasters risks according to how much damage they will cause to the region’s and country’s main crop - rice. High-level risks would mean a drop of 70 per cent in rice production; medium-level risks – an output decrease of 30-70 per cent; low-level risks – rice output decrease of less than 30 per cent. Yên also urged inter-provincial co-operation into building long-term climate change coping models. Luong Quang Xo, Vice Rector of the Southern Institute of Water Resources Planning, said his institute is working with the Department of Cultivation to build a natural disaster risk map, based on which provinces can reschedule their cultivation schedules, minimising losses. He proposed a number of measures, including switching to less water-intensive crops and saving water in the delta’s vast network of canals and in the fields to use in the dry season. “Awareness campaigns must be done so farmers know that drought is upcoming. Complacency following some years with favourable weather might lead to significant consequences,” Xo stressed. 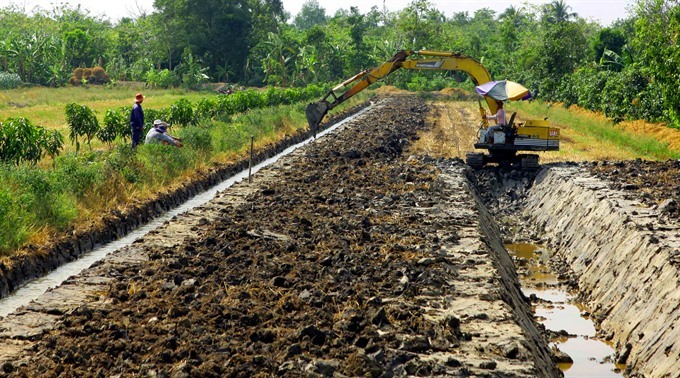 According to the Southern Institute of Water Resources, since 2010 salt intrusion in the Mekong Delta has been starting 1-1.5 month earlier and lasting longer compared to previous years. Prof Le Quang Tri, head of the Climate Change Research Institute under the Cần Thơ University, identified six challenges for the region: climate change and rising sea level, the development of hydropower projects on the Mekong River, increasing population and migration, overexploitation of natural resources, change of land use, and air, water and land pollution. Farmers in the region have to deal with many challenges and risks at the same time, and they need situation-based solutions that help them effectively adapt and improve their livelihoods, he stressed.